With a career spanning more than 50 years, John Fogerty is hailed as one of the most influential musicians in rock history, known for creating the soundtrack of a generation. As co-founder of Creedence Clearwater Revival, the group’s chief musical architect, and as a solo artist, Fogerty’s works rank as some of the most influential in American music history. As the writer, singer and producer of numerous classic hits including ‘Born on the Bayou’, ‘Green River’, ‘Proud Mary’, and ‘Bad Moon Rising’, Fogerty has been honored as one of the 100 Greatest Guitarists, 100 Greatest Songwriters, and 100 Greatest Singers by Rolling Stone. Earning induction to the Rock and Roll Hall of Fame, Songwriters Hall of Fame, and Baseball Hall of Fame, he is also a New York Times best-selling author for his memoir, Fortunate Son: My Life, My Music. John Fogerty recently signed an exclusive recordings deal with BMG, and is working on material for the his next solo release in 2018. His heralded live show continues to rock-out to sold-out audiences through his active tour schedule. John Fogerty's fervent vocals and modernized rockabilly songs built on his classic guitar riffs made Creedence Clearwater Revival the preeminent American singles band of the late 1960s and early 1970s. The Fogerty brothers were raised in Berkeley, where John studied piano and at the age of 12 got his first guitar. He met Cook and Clifford at the El Cerrito junior high school they all attended. They began playing together, and by 1959 were performing at local dances as Tommy Fogerty and the Blue Velvets. In 1964 the quartet signed to San Francisco–based Fantasy Records, where Tom had been working as a packing and shipping clerk. The label renamed them the Golliwogs and began putting out singles. "Brown-Eyed Girl" sold 10,000 copies in 1965, but the followups were flops. Greater success came after they adopted the CCR moniker in 1967. Several Fogerty compositions appeared on Creedence Clearwater Revival, but cover versions of Dale Hawkins' "Suzie Q" and Screamin' Jay Hawkins' "I Put a Spell on You" were the group's first hit singles. With the release of Bayou Country it became the most popular rock band in America. Beginning with the two-sided gold hit "Proud Mary" (Number Two, 1969) b/w "Born on the Bayou," Creedence dominated Top 40 radio for two years without disappointing the anticommercial element of the rock audience. CCR's rough-hewn rockers often dealt with political and cultural issues, and the quartet appeared at the Woodstock Festival. Creedence had seven major hit singles in 1969 and 1970, including "Bad Moon Rising" (Number Two, 1969), "Green River" (Number Two, 1969), "Fortunate Son" (Number 14, 1969), "Down on the Corner" (Number Three, 1969), "Travelin' Band" (Number Two, 1970), "Up Around the Bend" (Number Four, 1970), and "Lookin' Out My Back Door" (Number Two, 1970). Although Creedence's success continued after Cosmo's Factory, it was the group's artistic peak. Internal dissension, primarily the result of John Fogerty's dominant role, began to pull the band apart in the early '70s. Tom left in January 1971, one month after the release of the pivotal Pendulum which became the group's fifth platinum album. The band carried on as a trio, touring worldwide; Live in Europe was the recorded result. CCR's final album, Mardi Gras, gave Cook and Clifford an equal share of the songwriting and lead vocals. It was the band's first album not to go platinum. 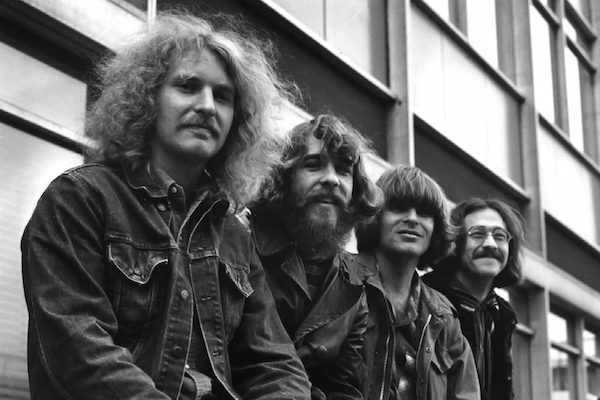 Creedence disbanded in October 1972, and Fantasy has subsequently released a number of albums, including a live recording of a 1970 Oakland concert, which upon original release was erroneously titled Live at Albert Hall (it was later retitled The Concert). Tom Fogerty released a number of albums on his own and with his band Ruby, and worked occasionally in the early '70s with organist Merle Saunders and Grateful Dead guitarist Jerry Garcia. He moved to Arizona in the mid-'80s and died there from respiratory failure brought on by AIDS in 1990 at age 48. Clifford released a solo album in 1972 of '50s-style rock & roll. Thereafter, he and Cook provided the rhythm section for Doug Sahm on his 1974 LP and the Don Harrison Band after 1976. In the mid-'80s Cook joined country group Southern Pacific, which had several hits. Not surprisingly, John Fogerty's solo pursuits have attracted the greatest attention. Immediately after the breakup he released a bluegrass/country album, The Blue Ridge Rangers, on which he played all the instruments. Two songs, the Hank Williams classic "Jambalaya (On the Bayou)" and "Hearts of Stone," made the Top 40. Nearly three years passed before his next LP, another one-man show titled John Fogerty. It sold poorly, and his next album, to be called Hoodoo, was rejected by Asylum Records. Fogerty and his family retired to a farm in rural Oregon. Except for two brief Creedence reunions he was not heard from for 10 years. He emerged with Centerfield (Number One, 1985), a typically simple, tuneful collection that sold 2 million copies and produced hit singles in "The Old Man Down the Road" (Number 10, 1985), "Rock and Roll Girls" (Number 20, 1985), and "Centerfield" (Number 44, 1985). "Old Man" and another song from the album, "Zanz Kant Danz," landed Fogerty in legal trouble however. The latter, a thinly veiled attack against Fantasy owner Saul Zaentz ("Zanz can't dance but he'll steal your money"), led Zaentz to sue for $142 million, not only over that song, but over "Old Man": Fantasy claimed the song plagiarized the music of the 1970 CCR B side "Run Through the Jungle." In 1988 a jury ruled in Fogerty's favor; six years later the Supreme Court ordered Fantasy to reimburse Fogerty for over $1 million in lawyers' fees. For years Fogerty refused to perform CCR songs live; he'd had to surrender his artist's royalties on them to get out of his Fantasy contract in the '70s. But during a July 4, 1987, concert for Vietnam veterans in Washington, DC, he broke his boycott, singing eight Creedence classics. He then dropped out of sight again, surfacing only for the annual Rock and Roll Hall of Fame induction ceremonies; in 1993 his own turn came when CCR were inducted into the hall. Fogerty refused to perform with Cook and Clifford that evening. After a decade remission, Fogerty released Blue Moon Swamp (Number 37, 1997); inspired by several trips to the Mississippi Delta, the album had taken over four years to make. It went on to win a Grammy for Best Rock Album, while the single "Southern Streamline" hit Number 67 on the C&W chart. Fogerty followed up the release with an extensive U.S. tour on which he played many CCR classics such as "Proud Mary" and "Fortunate Son" along with his new material; the live album Premonition (Number 29) was released the following year. In 1995 Cook and Clifford started touring as Creedence Clearwater Revisited. Fogerty sued and won a temporary injunction barring them from using that name, but his former bandmates ultimately prevailed in the case.